My dad used to salt his watermelon slices. He said it brought out the sweetness. Well, here is a drink that has just the right contrast of sweet and salt. kosher salt and a lime wedge for the rim. For the Watermelon Syrup: Bring everything to a simmer and let cook for about 5 minutes over medium heat. Strain the syrup through a chinoise and reserve juice. Chill the syrup. For the Watermelon Puree: Add the chunks to the jar of a blender and puree on high until you have a smooth puree. 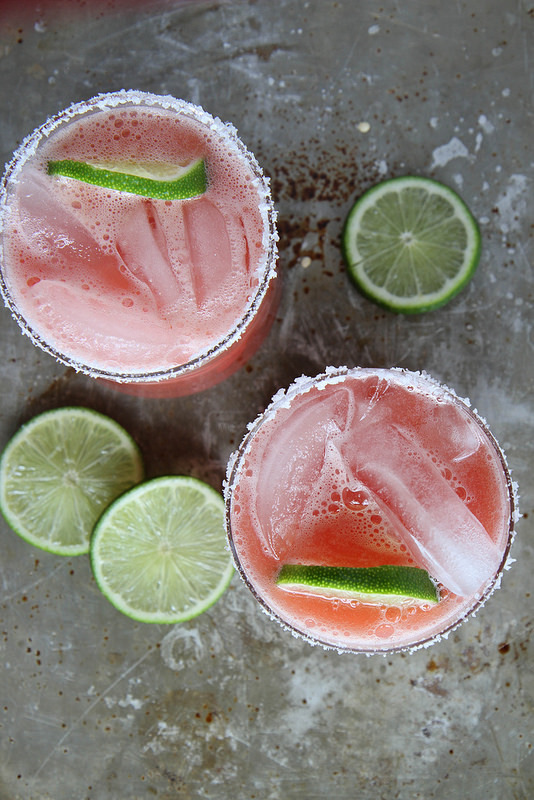 Wipe the rim of each glass with a wedge of lime juice and dip into kosher salt to create the salted rim. To make the drink, combine ice, the syrup, the puree, the lime juice and the liquor in a cocktail shaker. Shake vigorously and then pour into a chilled ice filled glass. Garnish with a lime slice.